Adam Morgan had little trouble with a starter-laden Yankees lineup on Sunday. TAMPA, Fla. – Adam Morgan doesn’t seem the least bit concerned with the fact that he may have to begin the 2016 season in Allentown. It’s a numbers game and the Phillies only have so many spots for pitchers, particularly the ones they see a future for as starting pitchers. Perhaps Morgan isn’t worried because he sure hasn’t looked like a pitcher who will start the season in Allentown. Morgan impressed for the second straight start on Sunday, holding the Yankees to one hit in four shutout innings to set the tone for the Phillies 3-0 victory. Morgan, who allowed one hit in three shutout innings against the Pittsburgh Pirates five days earlier, was economical on Sunday, too, needing just 39 pitches in four innings (and throwing 28 of them for strikes). Morgan, 26, entered camp in what’s widely considered to be a three-man race for the fifth and final spot in the rotation with fellow left-hander Brett Oberholtzer and hard-throwing right-hander Vince Velasquez. The 23-year-old Velasquez continued to show promise against a tough Toronto Blue Jays lineup on Saturday and Oberholtzer followed Morgan on Sunday against the Yankees and threw three shutout innings for the second straight start. Oberholtzer, 26, hasn’t allowed a run in eight Grapefruit League innings (three games) and has walked just one batter this spring. Morgan, Oberholtzer, Velasquez. It all adds up to a tough call for manager Pete Mackanin and company in the next three weeks. A couple of notes to consider as the competition heats up: the organization does not want to move Velasquez back into the bullpen (where he pitched some for Houston last year) and Oberholtzer is the only among the three out of options (he cannot be sent to Triple-A before clearing waivers). One possible option for the start of the season: start Morgan in the rotation, Oberholtzer in the ‘pen, and send Velasquez to Triple-A, where he can continue to refine his stuff (and likely gain an early-season promotion). Since injuries to starting pitchers are almost inevitable, it’s probably too early to handicap the race, though; the shuffling of the staff might take care of itself. A few days ago, outfield prospect Nick Williams didn’t get into a game and wasn’t particularly happy. “I was going to hit for the cycle,” Williams kidded to Mackanin after the game. The manager told the 22-year-old outfielder that he’d get his chance his spring. Williams has nearly made it happen in the last two days, if not in one game. Williams launched a three-run home run on Saturday, hit an RBI double off CC Sabathia in his first at-bat on Sunday, and then ripped ball over center fielder Dustin Fowler’s head in the eighth inning and landed on third base. According to the official scorer, the last play was an error. According to everyone else in the press box, it should have been a triple … which would have given Williams, acquired in last July’s Cole Hamels trade, the most difficult three legs of a cycle in a 24-hour span. The two veteran pitchers the Phillies acquired in trades to fortify a young starting staff returned to action Sunday. 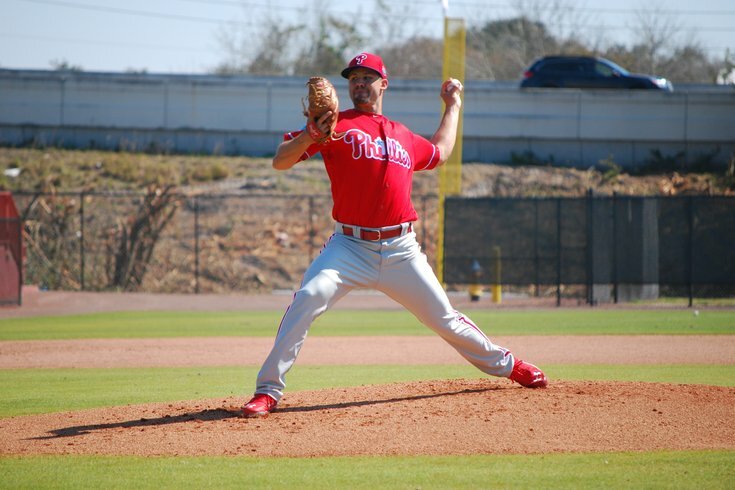 Jeremy Hellickson and Charlie Morton, both scratched from scheduled Grapefruit League starts in the last five days with illnesses, pitched in intra-squad minor league games at the Carpenter Complex on Sunday morning. Hellickson, picking to catcher Carlos Ruiz, threw four perfect innings. He struck out four and threw 36 of his 55 pitches for strikes. Hellickson remains a very strong option for Mackanin on Opening Day on April 4 in Cincinnati – three weeks from Monday. Aaron Nola could be another option although if Nola pitches in the second game of the regular season, it would also put him in line to pitch in the home opener at Citizens Bank Park on April 11. Morton, who was originally on tap for Friday’s game against the Atlanta Braves in Orlando, also threw four shutout innings. He allowed two hits, struck out four and walked one. The former, long-time Pittsburgh Pirate said he’s been impressed with the young talent in camp. One name Morton singled out: Jake Thompson, the highly-touted right-hander who came over in the Hamels trade and was sent to minor league camp last week.